If you consider yourself an expert then try this one. Narrowgauge, Lorries, and Clippers...and never enough money. 200 Goods to be made and supplied across the sea. Feeling generous Ive given you 3 years this time rather than 2. No picking up empty vehicles to place them back at the start of a route nor selling them only to go buy another one of the same type. You can of course sell them to raise cash..but please no exploiting. Station stretch up to 4 places OK..but not necessary. When the Jinty locomotive appears and an AI uses it you will be amazed at its speed relative to what you have got used to. 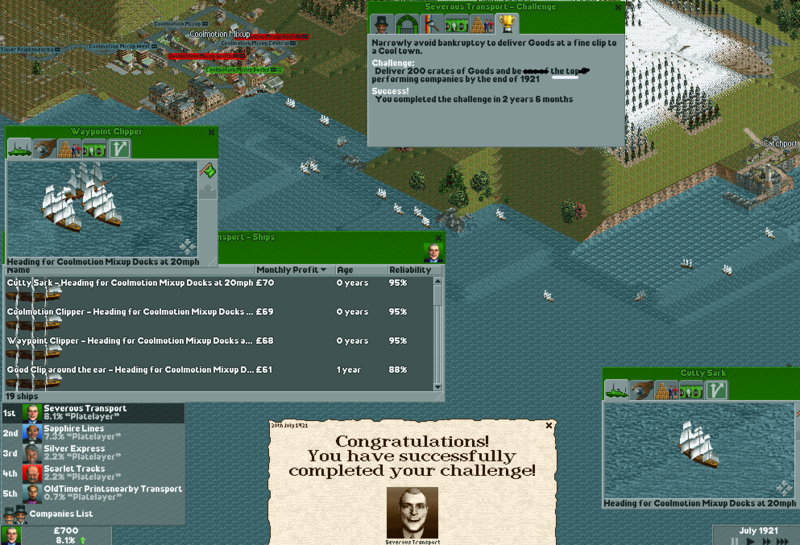 Oh yes..and as I completed it top company, on my third attempt, ive imposed that condition as well. Sabotage and micromanaging loading and unloading is fine.